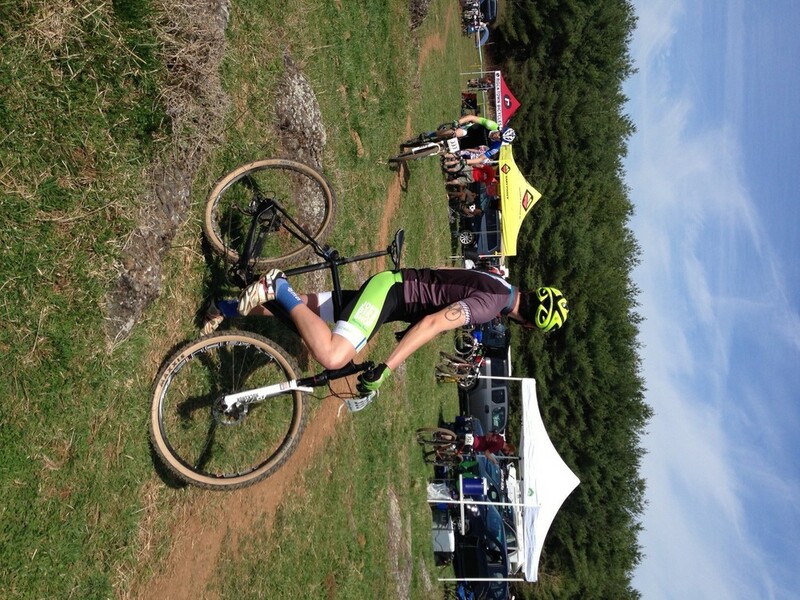 The Bakers Dozen is a 13 hour race in Leesburg, Virginia. A very popular race in Virginia, it sells out every year and typically draws some good competition. This year, I planned to try the race for the first time as part of a 3 man relay. We would take turns doing a single lap at a time to try to get as many laps in over the 13 hours as possible. I joined up with Patrick Traill and Ethan Frey to see how we could do against the field. Last year’s winners, Rocktown Racing, did 21 laps in 13:09. We were shooting to get 22 (8.5 mile) laps in, and with that, hopefully lock up first. A relay over 13 hours is tricky. On one hand, its an endurance race as you’re racing all day. On the other hand, each lap is a separate race where you are pushing yourself to the limit, with fairly large breaks in between. I talked to my coach Chris Beck (Chris Beck Racing) beforehand and he basically told me to go as hard as I could every lap, and to simply rest in between. So that is what I did, and it turned into doing 7 laps as hard as I could. The race began and our first guy, Ethan Frey, led us out. He passed things off to Patrick Traill next, and I rounded things out on lap 3. They told me my job as the last guy was to make sure we made the cutoff for 22 laps. If we were close on our 20th lap, I needed to be able to go out and fly so that Ethan could go out for the 22nd lap. Great, noo pressure! My first lap could be described as a traffic jam. Since Ethan and Patrick had ridden so fast the first two laps, we were now catching up to and lapping other teams and solo riders, so I was in a constant state of passing, slowing to pass, or speeding back up. Additionally, having never ridden the course, I was learning the hard way just how tight some turns were, how to go over and through certain rocky sections and when to hit the gas. When I started, I knew we were a bit behind Haymarket, a team of very strong local pros, and last year’s winner, Rocktown. Shortly after starting I reeled in Rocktown and passed, but in the process picked up a nice train of racers who sat on my wheel and paced. I finished the first 2/3 of the course and accelerated to gap my train a bit to give Ethan a bit of a heads start on Rocktown going into lap 4. It worked and we had a tiny bit of breathing room. As the laps wore on, Haymarket kept getting further and further up the road. 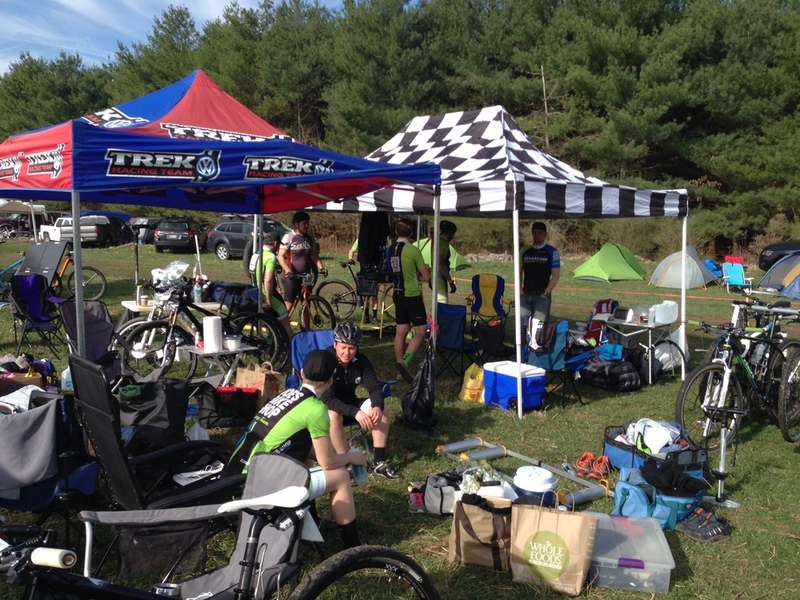 We had the perfect pit location that was in a spot that the course passed twice thanks to Joe's Bike Shop. The first time you passed it, the next lap rider knew they had about 8 minutes until you would be back and ready to transition. So we could sit, eat/relax, and wait for the first pass, then gear up, warm up and get ready to roll again. This was also great as we could see how far ahead and behind the competition was on any given lap. Going into my second lap (our collective 6th lap) I knew two things: Haymarket was riding faster than we were, and Rocktown and the Old Line Velo teams were right with us. I began my second lap and the crowds had thinned just slightly. I went into the woods right behind Tony Vacchino, an OLV racer who happens to be one of best technical riders I have ever seen. He was absolutely flying through the course, taking turns faster than I would have thought possible, going over rocks with seemingly no effort. Following him was very educational as I learned the best way around everything. Each time we’d pass someone though, he’d get around them first and put in a little dig. A gap would form between us and I’d have to claw my way back to keep him in sight. Rocktown was nowhere to be seen at that point, so it was just me chasing OLV. As we approached the pits, I attacked Tony but he was waiting for it and I couldn’t shake him free. We entered the Pines (the last 1/3 of the lap) and Tony jumped in front and upped the pace. I latched on and we flew through this fast section of the course, averaging over 14 mph. Leaning through every turn, ducking under branches, around tree trunks it felt like a race track. Confidence is vital for survival at such speeds. You have to know your hands aren't slipping off the bar, and that your tires are not going to break free and lose traction. With Specialized tires and ESI grips, I didn’t think twice about it. Eventually we both dialed it back, seeing we were glued together, and chatted a bit as we finished up our respective laps, acknowledging the good battle we had on the lap. 7th, 8th, my turn again. Going out on the 9th lap, I knew we had a little gap over OLV and were widening our margin over Rocktown who was sitting in 4th. Not wanting to battle with Tony again, or to give them any hope of pulling us back to take back 2nd, I dug deep on my 3rd lap. At this point, I’d put in about 70 minutes of all-out effort during the day, and it wasn’t easy to get the engine warmed up again. But after about 3 minutes of feeling terrible, your legs come back and you start to feel good again. I pushed and pushed the whole lap hoping to not see Tony coming up behind me. When racing all out, you are shifting constantly. Up, down, two up, back down. You are essentially pushing your drivetrain to its absolute limit so as to be as efficient as possible. But, as expected, mine performed flawlessly all day, unlike many I saw on the trail side trying to coax life back into their various mechanical issues. Thanks to Twenty20 and SRAM for the great XO1 system! I finished my lap, utterly exhausted, ate and drank and almost fell asleep in our pit tent. The 12th lap came all too quickly and my body was feeling a bit haggard. Muscles were tightening, energy was depleted. The sun was getting hot, more than forecasted and dehydration was setting in. I set out hard, just like the other laps, but I hoped to settle into a pace more reasonable given that I still had 4 laps to go, and many hours remaining. I was able to hold a steady pace through the lap, and was particularly happy to find the crowds had thinned a bit finally and passing was becoming easier. I focused on the positives of the day to keep me pushing hard. My Epic World Cup had been flawless, and with the course being so fast, having full suspension was a back saver! After finishing the lap I inhaled as much food as possible, and drank a ton of water. Midway through a 13 hour race, I couldn’t afford to feel how I did. I needed salt, calories and water. I checked the live results that Go Time Racing provides and saw that we were close to 12 minutes back from Haymarket, and only a minute or so up on OLV, with Rocktown a few more minutes back. My energy began coming back and I started to feel better when it was time for lap 15 (my 5th). Our lead over OLV was growing but a single flat tire, broken chain, or any mechanical issue could wipe that lead out instantly. I focused on riding carefully on the rocks so as to avoid flatting. 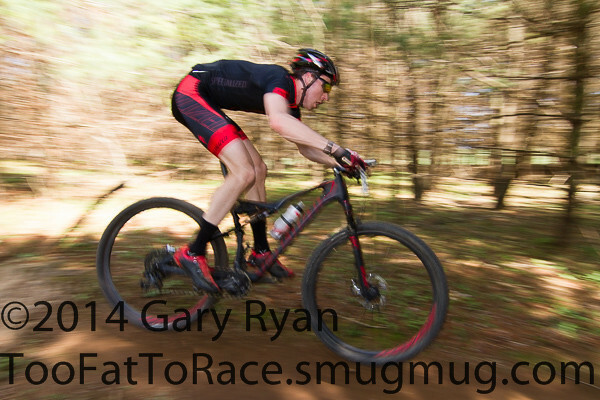 I entered the woods with a rider from the “geezer” Haymarket team (they had two teams) and realized a guy perhaps double my age was holding my pace with seemingly no effort. That irked me a bit but there was nothing I could do to lift my pace through the technical part of the course. While we were competing in different categories, he in the above 40 category they affectionately dubbed the “geezer” category, there was still overall honors to consider. So when we hit the last 1/3 of the course I floored it, and finally was able to shake my shadow. The Haymarket "geezer" team had a really great showing and ended up winning their category! The day drew on and I felt better and better physically. My legs were dying a slow death, but I wasn’t hungry or thirsty anymore; a very good sign your body isn’t shutting down. A 13 hour race that starts at 9am in April is guaranteed to end in the dark, so when my 6th lap came up we were right on the edge of needing lights. I put them on my bike and hoped I wouldn’t need them. Riding in the dark, even with the brightest lights slows you down, and I wasn’t interested in seeing less and increasing my risk of crashing. I rode out and had probably the most enjoyable lap of the day. I rode hard, but was able to watch the sun set through the trees as I rode around the course. I didn’t have to navigate around many groups and was able to ride mostly alone as I worked my way back to the transition area. I was smiling, soaking it all in. I was riding a bike on a gorgeous day with a bunch of friends. What a gift. It was dark. Small camp fires were popping up all over the farm that was our race course for the day. The mood was good as the end was now in sight for everyone. I waited impatiently for my last lap, and was excited when my turn came. I had about 60 minutes to get my 7th lap in (our 21st) so that Ethan could go out for a 22nd before the 10pm time cut off to start another lap. Haymarket was long gone with something like 15 minutes on us (so we thought), OLV had slowed and were about 7 minutes adrift and Rocktown was even further. I was happy the pressure had lifted and I started onto my lap, lights ablaze, and with a higher contrast yellow lens in my Spy Daft glasses. Doing the course 6 times that day, you start to memorize everything. Every rock, root, turn, log. What the traction is like here, what’s the best way over that rock there; it all becomes second nature, which makes riding it at night a bit easier. I glided through the course and watched the other lights of other racers dance through the trees. It was like magic, I could’ve enjoyed that for hours. I passed our pit once more before finishing the last 1/3 of the lap and shouted a heads up to Ethan that I was 8 minutes out. Once more through the fast section and I was done. Ethan finished our 22nd lap and powered all the way through to the end, shutting the door on OLV finally and securing our place on the 2nd step of the podium. We ended up 9 minutes down on Haymarket, 8 minutes up on OLV and 23 minutes up on Rocktown. It was a fantastic day. Patrick, Ethan and I all raced our hearts out. I can't imagine having done the race with a better set of guys.a Sitting around between laps talking to other teams was a ton of fun, and the course was a dream. Go Time Racing did a fantastic job and the 120 pizzas they had delivered at 10:30p was a pretty nice bonus! With more laps than the winners last year, it was disappointing to not win, but given who we were beat by, we were happy we got as close as we did. It turned out we had raced 10 laps faster than Haymarket but 12 laps slower. Oh well, next year! As the second fastest team of the day, we landed ourselves in the money which was great. Looking back, the course, camaraderie and overall atmosphere of the race put it solidly into the top 3 of my favorite races I’ve done. Big thanks to Go Time Racing who absolutely nailed the execution of this race, and did so without a hitch! What a great day.